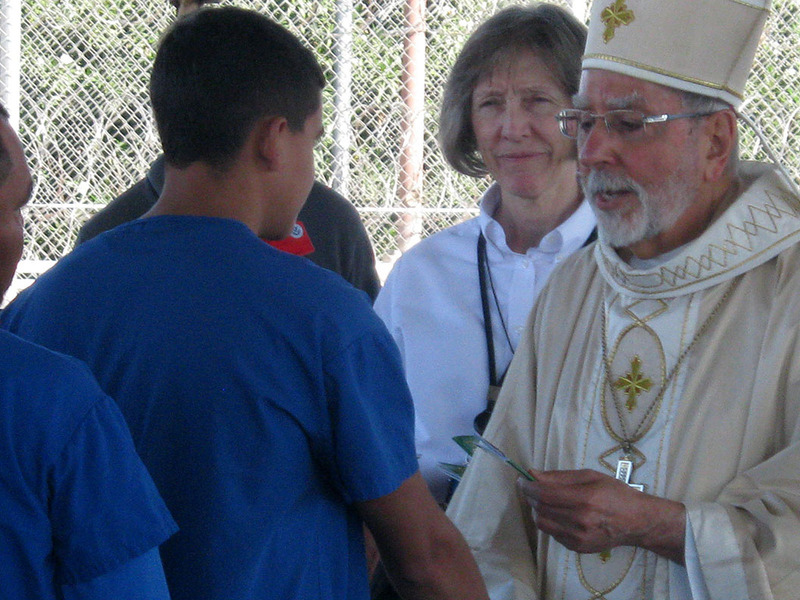 Yesterday I traveled to Florence, Arizona, to a federal detention facility one hour north of Tucson, where we celebrated Mass with 50 men who rarely have a chance to attend Mass, and who are separated from their family and friends. We sang hymns together, prayed together and exchanged the sign of peace. I tried to follow along in Spanish. At the end of the Mass, a few came up to greet us, shaking hands and thanking us for coming. We were unable to bring cameras or cell phones into the facility, so I will try to give a picture of an event that was very moving for everyone involved. The Mass was celebrated by Father Kevin White of Jesuit Refugee Service. JRS has a contract with the government to provide chaplains to these detention centers, and I am traveling with them to visit some of their border ministries. Dominican Sister Lynn Allvin is the chaplain at the Florence facility and helped to organize the service. She runs a weekly communion service for the detainees and also helps with counseling. Many of the men at the Mass are from Central America. Some of them were picked up trying to cross the border, but others have been in this country for many years. Their futures are very uncertain. Some will be in the detention center for only a few days—the government runs planes back to Guatemala from Phoenix every week. Others will be here for longer as they appeal their detention or seek asylum. The men looked very young. They were on the short side, and all wore the same government-issued slippers. The facility is only for adult males, but determining the age of a detainee can be difficult. Dentists are brought in to look at their wisdom teeth to try to figure out their age. The men were dressed in blue or orange uniforms, the color designating their security status in the facility. We were given stapled-together song books and a pamphlet with the readings and responses in English and Spanish. We were in a cafeteria, but Sister Lynn hung a cross from the wall, and, in a touch I found oddly comforting, designated the songs on a banner using felt numbers. A man played guitar and two others led us in song. One man spent most of the Mass on his knees, his hands held up in prayer. Some of the men looked distraught during Mass, but others were smiling—more than I would have expected. In his homily, Father Kevin acknowledged that these men are on a difficult journey, but assured them God is with them. I sat to the left of the detainees with staff and board members from JRS. We were greeted with applause upon our arrival, and a few men made their way over to us during the sign of peace to give us their hands. The Mass lasted about an hour. The microphone didn’t always work (another comforting detail), and at the end Sister Lynn asked who in the congregation was celebrating birthdays this month. A few men raised their hands. There were at least two guards in the room. Occasionally we could hear their radios go off. At the end of Mass, some of the men came up to us, said hello and shook our hands. We did not learn their names. Many of them are known to staff only by their “alien number.” Sister Lynn tries to learn their names and on occasion will call them Mr. Garcia or Mr. Perez to give them a sense of dignity. The men often leave the facility abruptly. One day they are there, the next they are gone. (The average stay is three weeks.) The chaplains often don’t get to say goodbye, but sometimes they do. Sister Lynn tells them that they will see each other again in heaven. What palpable sadness I felt reading this simple article about a liturgy at a detention facility. One easily feels the pain, confusion and worry of these inmates, yet, one easily sees the "freedom" it offers these men who want nothing else but to have what we all share in this wonderful country. Pushing aside all politics, this article's simple presentation opens up an opportunity to meditate on our Christian responsibility to these people, our brothers in Christ Jesus. And, Sister Lynn, God bless your servant heart.